After exiting the train in Resembool, Winry and Scieszka encounter a mysterious man. When he turns up on Grandma Pinako's doorstep wondering where his house has gone, the old women tells the girls that, "this is Ed and Al's father." Meanwhile Ed and Al are venturing through the desert. It's Ed's plan to return to Resembool. There is something that he must get. Ed is now aware that the Fuhrer is a homunculus as well as the man's secretary. When Al won't stop talking about how Juliet Douglas was created, Ed turns angrily touching his younger sibling and sparking a very unusual reaction. For a few seconds, Al seems to glow. Etchings appear on his armor and a vision of a foggy place with a large gate appears. It's a place that Al has seen before. Looks like the boy has truly been made into the philosopher's stone. The countryside of Resembool is beautiful. Winry visits the grave of her parents and finds Mr. Elric sleeping by his wife's grave. It's been 6 years since she died. While they are at the gravesite, Scieszka gets a shock when Lieutenant Ross and Sergeant Brosh arrive in their street clothes. Seems Lieutenant Ross heard the boys were wanted and took a day off just to warn and protect the boys. Brosh came along hoping it was a date....silly boy! Mr. Elric points out that the path the boys will probably take is over a mountain and through a valley. Winry grabs Scieszka and goes off to find her friends. Sure enough, Ed and Al are traveling that route, but they're not alone. When Havoc and Fuery corner Ed, the boy refuses to return. There's a slight confrontation with Havoc's gun causing injuries to both soldiers. Ed must use alchemy again on Breda and Falman before he can escape. A short time later, all of the Colonel's group are together discussing their next move. Suddenly, the most unusual screams ring out from the valley. It's Winry and Scieszka riding a bike at great speed. Hawkeye shoots the two wheeler stopping the girls. The soldiers take them into custody and continue their search for the boys. It isn't long before Armstrong (creating hollow rocks) and the Colonel (heating the air inside to set the rocks on fire) have the boys at a stand still. Winry fears the worst when the Colonel approaches the boys slowly. "Stop!" she screams. Colonel Mustang unloads his feelings. He spoke of what happened to Winry's parents (see Mustang's character summary). Then he added angrily, "The reason I chased after you two wasn't because of my orders. It was because you guys made me angry! "Why did you run away without asking for my help?!" Rose and Lyra wander through a city they will soon call home. The two approach an abandoned Temple very similar to the one in Lior. They enter, and Lyra uses alchemy to restore its damaged appearance. Looming inside is Sloth, Wrath, Gluttony, and poor Lust, who is pierced to the wall for letting Ed and Al escape. The large double doors open to where the homunculus reside....it's Lyra and Rose. Wait a minute?!? Why are the homunculus bowing before..........LYRA!?! The next scene returns us to the valley where the Colonel is angrily yelling at the Ed and Al. "King Bradley is a homunculus," the boys tell the stunned soldiers. As they are discussing the situation, more soldiers arrive. Major Armstrong volunteers to take them back to Lior and keep them busy for now. The rest head to Resembool with Ed. On their way Winry notices that Ed's watch is gone. Ed explains that Archer had wanted it. That's when the Colonel admitted that Archer was using the red stone to amplify one's alchemy. Ed is furious that he wasn't told this before. When Al tries to stop the fight between the two, he touches Ed sending his huge metallic body flying into the nearby river. Everyone panics...for water would wash off his blood seal, but that didn't happen. Al almost gives away his secret, but Ed brushes it off and continues towards Resembool. When they arrive in Resembool, the group peer through the bushes looking for any type of pursuer. They see Sergeant Broche tearfully walking towards them. He's upset because Lieutenant Ross is enamored by Mr. Elric. Broche is not the only one upset! Ed goes charging up to his father and belts him. "What are you doing flirting!?!" Ed screams. Al realizes that it's his father and runs happily towards the man. Once the commotion is over, they all congregate inside the Rockbell home. Ed explains his anger towards his father: He left shortly after Al was born. They were told that he was researching alchemy, but not one letter was ever written. Only his scent lingered in the house. Interesting enough, Ed remembers that when he met Lyra in Lior, she had that same scent. Hohenheim is sitting outside petting Den. When he hears Al utter the name Dante, his expression changes to shock. Later that evening when most are asleep, the Colonel talks with Mr. Elric. The older man explains homunculus and then adds, "Even though they are homunculi, the country is functioning and the military is prospering....you could just ignore it." He then changes the subject by asking Ed what he's been up to. Ed refuses to explain anything to his father and tries to pull Al inside. However, the younger sibling doesn't harbor hatred towards his father and sternly tells Ed that he will sleep by his father's side that evening. In the morning, Al leaves his father's side in order to get food. When the boy returns, Mr. Elric is nowhere to be found. At the same time back at Winry's, Colonel Mustang must leave when he gets a call saying an investigative committee is on the way. Granny Pinako ushers the boys and Scieszka into the basement. After a brief discussion of Ishbal, a light bulb goes off in Ed's head. He believes the homunculi are the key to causing conflict in order to create the philosopher's stone. It's then that Scieszka says Lieutenant Colonel Hughes must have discovered this and was killed for it. Ed and Al go ballistic! All this time, they were not aware that their friend Hughes was murdered! Granny Pinako calms them down before they do anything stupid. Explosive force shatters the doors of the temple where Lust and the others are kept. To Lyra's surprise and pleasure in walks Hohenheim. With disgust he admits that he knows she is, in fact, Dante. She angrily sets Gluttony against him, but he easily fights the hungry homunculi off. Even though their bodies are rotting, they both have great strength. He says that he will tell her the secret of preserving her body if she lays off his sons. Back at the Rockbells, they believe the Colonel has convinced the military to back off. Winry asks where Ed is. Al recalls his brother saying that he had something important to do. The sun sets on the gravesite of Trisha Elric where Ed digs feverously. He finds a precious object and holds it tightly. "I'm sorry, mother," he says sadly. Can you guess why he needed something from his mother's grave? You should if you've been watching carefully. Don't miss the next exciting episode. Lyra and Hohenheim discuss their decaying bodies as well as their past. It was 400 years ago that they accomplished their goal. Using those humans that escaped from the witch hunt and those who were dying from the plague, the philosopher's stone was created. However, because of the after effects of the transmutation, Hohenheim was dying. Using the Philosopher's Stone, Dante attached his soul to the body of another person, and it was then that we were given eternal life. By using the Philosopher's stone, they transplanted their souls again and again. "Why did you have us search for the philosopher's stone?" Lust asked. "When Hohenheim left my side, I needed it." Dante explained. Returning to headquarters, Colonel Mustang is speaking in front of the Fuhrer and other military officials. They are angry with the Elric brothers. The Colonel says the boys have changed their path and are heading up North. Then Mustang says he wants to discuss Juliet Douglas as she may be behind the death of Maes Hughes. Once the meeting has adjourned, Hawkeye and Mustang visit Havoc in the hospital. After talking amongst themselves, they realize that every war has been to force those in despair to create the philosopher's stone. Back at the Rockbell's, Ed is dyeing his hair black while Al has been made into a large bronze statue. (Check it out, it looks like Armstrong with hair.) Winry is saddened when learning that Ed must leave again, however, he swears it is NOT to avenge Hughes death. They leave by train not long after. "I've done a lot of research since you've been gone. The gate which is the source of the power of alchemy is within us," Dante says walking forward holding the crying baby. "And when the link between the mind, soul, and body are still weak," Dante continues, "For example, with a baby, one can summon the gate more easily. Shall we try it?" 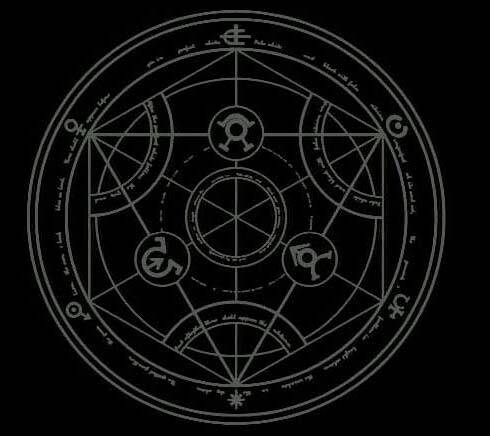 She rips the blanket off the baby, places a transmutation circle on the child, and throws it up in the air. The gate appears before Hohenheim. The door slowly opens and dozens of dark arms pull him in before the large doors slam shut. Of course, all this has terrified Wrath. Luckily, Sloth is there to calm him. With Hohenheim gone, Lyra holds the unharmed baby and orders her homunculus to retrieve the philosopher's stone from the boys. Exiting the room she tells them that depending on how she feels, she'll make them human at that time. The cunning women brings the baby into the room where Rose waits. "You must eat more," she tells Rose, "or my dresses won't fit." Meanwhile, the military is searching the train. The boys must make a daring escape when some soldiers are about the break Al's statue. They are able to find a room to take refuge. Ed tells Al to stay put and leaves to carry out his plan, but Al does not sit for long. When he runs from the room, Ed is gone, however, a phone catches his eye. Later that day, Ed meets up with his sensei. He asks her for piece of her deceased baby. She's is no fool.....she knows what he is up to. At the same time, Al contacted Tucker. The man-beast shows the shocked armored boy................NINA!